The consortium of KPMB Architects, Michael Van Valkenburgh Associates (MVVA) and Urban Strategies developed the winning proposal to restore and beautify the central spaces of the University of Toronto’s historic St. George campus. As a major initiative of the University of Toronto and one of the largest landscape infrastructure projects in Canada in our time, the vision is to transform 20 acres comprising four landmark spaces that define the historic downtown campus. The concept establishes a framework to guide the future evolution of the campus as a pedestrian-friendly realm and to restate the fundamental role of green space as a factor of academic excellence. 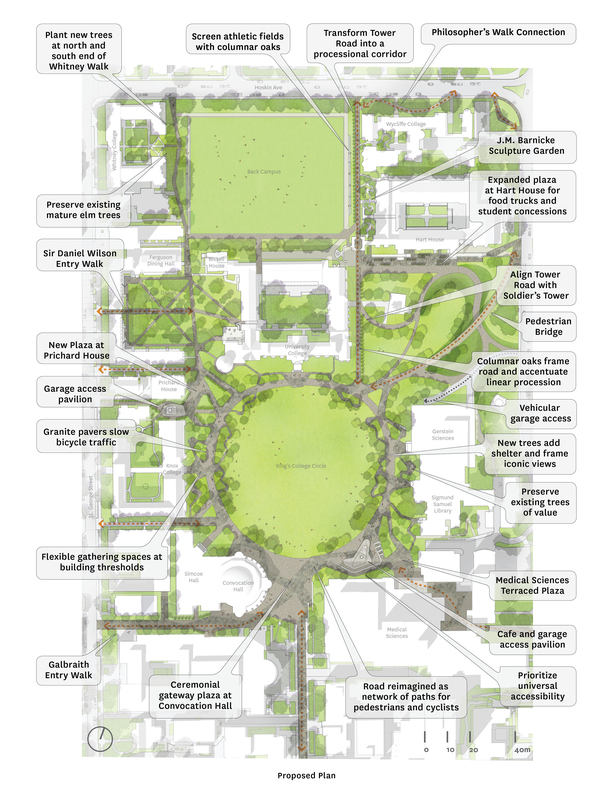 A car-free necklace of meandering, interwoven paths is proposed to animate King’s College Circle and a stately column of oak trees around Tower Road are two key strategies in the reimagining of four landmark green spaces that define the university’s campus: King’s College Circle, Hart House Circle, Sir Daniel Wilson Quad and the Back Campus Fields. A priority is to restrict vehicular traffic and remove all at-grade parking while increasing space for bicycles. A major underground arrivals court for people arriving by car is located under King’s College Circle and forms a major component in the vision to create a pedestrian-friendly realm. KPMB Architects / Michael Van Valkenburgh Associates, Inc / Urban Strategies Inc.